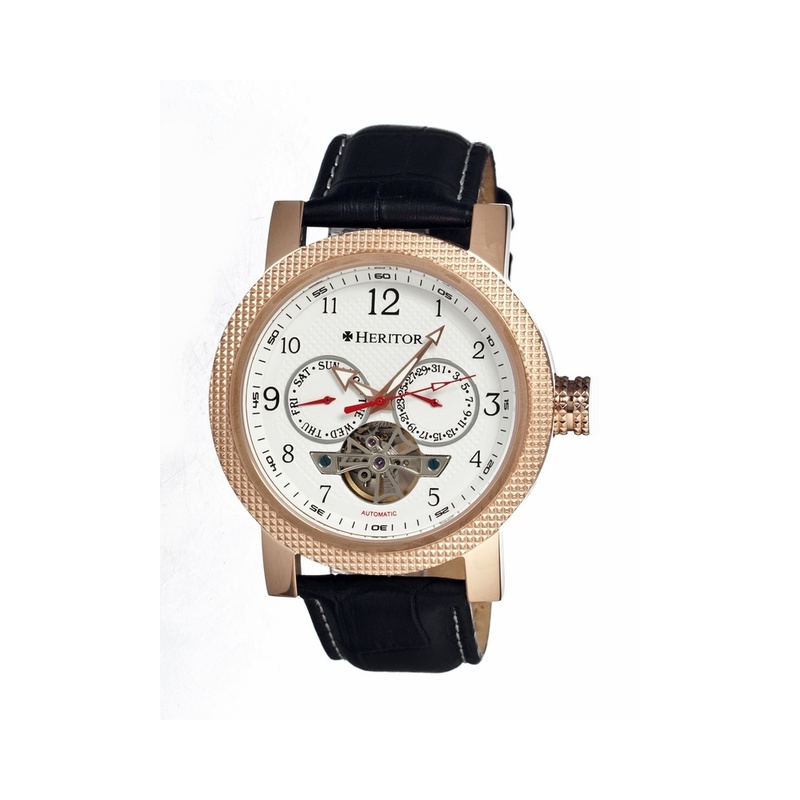 Heritor Watches is a brand from the American fashion watch manufacturer Resultco. Heritor are a 21st century international brand. Whilst the watch design is approved and finalized in America, the parts for the watches are sourced from all other the world based on quality and value. They make use of high-grade stainless steel and the leather is purchased from Italy for many of their watch straps. The parts for the watch movements are also sourced from various countries around the globe to create a quality product with premium value. The last Heritor watch I’m showcasing today is this Herren edition. This model is built with a stainless steel casing with a PVD rose gold finish. It has a diameter of 45mm with a thickness of 15mm. The strap is made of genuine leather and fastens with a buckle clasp. The dial features a clear and easy to read display with two sub-dials that are used to show the day and date. There’s also a small keyhole port that allows you to view the balance wheel from the automatic self-winding movement. This Heritor timepiece is powered by a automatic self-winding movement meaning it never needs a battery as it’s powered by movement. You can view this movement through the rear exhibition caseback, one of my favourite features on a watch. You’ll be able to read my full Hr1503 men’s Heritor watches review here soon.